The purpose of cupping is to enhance circulation, help relieve pain, remove "heat" and pull out the toxins that linger in your body's tissues. 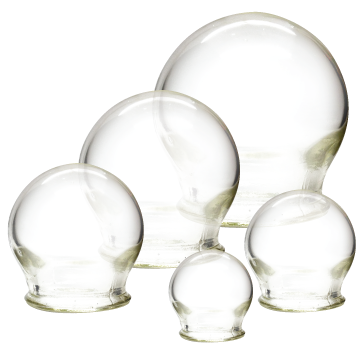 Extra thick and heavy glass with round top to slip cups easily and comfortable. Personal use item. For Health purpose, NO EXCHANGE/RETURN. Please consult professionals before doing cupping treatment. Cupping treatment should not over 10 minutes in order to avoid injury to the skin and it may also cause skin infections. After cupping, do not immediately take a bath.